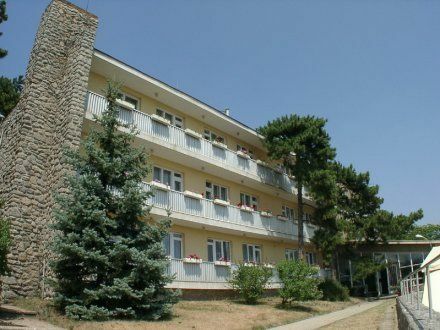 The Hotel Fenyves Panorama*** is a family atmospheric hotel, which is located on the hillsides of Mecsek by the pine forest, right above the centre of the town. Pécs, the more than 2000 years old, Mediterranean town, with its cultural and artistic face, Roman age archaeological excavations, entitled to be called one of the most beautiful towns in Hungary. In the enchanting square, in front of the Basilica there are a group of ancient monuments, which have been on the UNESCO World Heritage list since November 2000. The ancient Christian necropolis is a unique relic from the ages of ac 313-430. Pécs is waiting for the guests with the famous theatre of Pécs, cultural programs, special Mediterranean atmospheric restaurants, confectioner's shops. Hotel services: 24 hour reception service, sauna, massage, table soccer, parking lot for cars and buses, internet connection (WIFI), SAT TV, safe, bicycle storage, baby bed and chair can be asked, room service, taxi order, baggage room, theatre ticket order, restaurant, banqueting hall, terrace with beautiful panorama, hair dryer and iron can be asked at the reception. Rooms: 23 full renovated rooms. 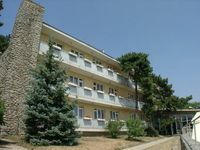 20 rooms are with balconies, having a southern aspect with a view of the town, 1 apartment for families and 2 rooms are facing to the forest. Restaurant: air conditioned, can hold 80 person. The restaurant (and the banqueting hall too) is suitable for arranging weddings, receptions, high standard balls and other different programs. Panorama terrace: In a good weather day you can spend some nice hour on the Restaurant's terrace, while enjoying the taste of good foods and wines. Grill terrace: Can hold 45 persons. Banqueting hall: 2 pieces of banqueting halls can hold 2*25 persons. You can ask TV, video, projector, phone, flip-chart. Wellness: The hotel has a sauna and a masseur.